..... Click the link for more information. , known also as plumbago and black lead. It is dark gray or black, crystalline (often in the form of slippery scales), greasy, and soft, with a metallic luster. It is a good conductor of electricity and does not fuse at very high temperatures or burn easily. It occurs in nature in grayish-black masses, massive or crystalline, and is obtained in various parts of the world—in the United States (massive) in Nevada, Michigan, and Rhode Island and (crystalline) in Alabama and North Carolina; in Brazil; in the British Isles and on the Continent; and in Sri Lanka, Madagascar, and Siberia. It is also prepared artificially by treating hard coal in the electric furnace, a process discovered by E. G. Acheson. The uses of graphite are wide and diverse. The so-called lead of pencils is in reality a mixture of graphite with clay. Crucibles required to withstand high temperatures and also electrodes are commonly made of graphite. It is used also in stove polish, in some paints, and as a lubricant. a mineral; the hexagonal crystalline modification of pure carbon that is the most stable under the conditions of the earth’s crust. Well-formed crystals are rare, and their shape is usually laminar. Natural graphite is most often found in the form of flakes without crystallographic contours and in the form of aggregates of flakes. 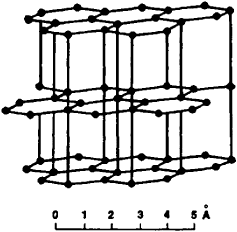 The crystal lattice of graphite is of the layered type (see Figure 1). In the layers, the carbon atoms are located at the points of the hexagonal cells of the layer. Each carbon atom is surrounded by three adjacent atoms at a distance of 1.42 angstroms (Å). The layers are parallel to one another at a distance of 3.55 Λ with a symmetrical repetition in every other layer, since they are reciprocally displaced. The bond between the carbon atoms in the same layer is strong and covalent; between the layers it is weak and of the residual metallic type. The particular features of the graphite structure and the presence of different types of bonds cause the anisotropy of a number of the physical properties. The residual metallic bond produces the opacity, metallic luster, and high electrical conductivity. The unidirectional cleavage characteristic of graphite also depends on the poor bonding between the atomic layers. Its density is 2,230 kg/m3. Because of the ease of rupture between the lattices perpendicular to the plane (0001), the hardness of graphite on the mineralogical scale is 1. In the layer itself, the hardness is high (5.5 and higher). The high melting point of graphite (3850° ± 50°C) is explained by the great strength of the bond between the atoms in the lattice itself. Graphite is a good conductor of electricity (the electrical resistance of the crystals is 0.42 x 10-4 ohms per m). Graphite powders and blocks have significantly greater resistance, which increases with increasing dispersion (up to 8–20 × 10-4 ohms per cm). Graphite is magnetically anisotropic and acid-resistant; it oxidizes only at high temperatures but is soluble in molten iron and ignites in molten saltpeter. It has a low thermal neutron capture cross section and is easily worked. The properties of graphite are significantly altered by neutron irradiation (its electrical resistance and elastic and hardness moduli increase; its heat conductivity decreases by a factor of approximately 20). A distinction is made between deposits of crystalline graphite, which is related to magmatic rock or crystalline schists, and deposits of cryptocrystalline graphite, which forms in association with metamorphism of coal. In magmatic rock, graphite crystallizes from a melt and is seen in the form of individual scales and accumulations (pockets and stockworks) of varying size and content (for example, the Botogol’ deposit in the Buriat ASSR, where sections of pure graphite are worked without dressing). Graphite is extracted chiefly from crystalline schists that formed as a result of the deep metamorphism of clays containing bituminous substances. The graphite content in the crystalline schists ranges from 3 to 10–20 percent and higher. The graphite flakes are extracted from the ore by flotation. In the USSR, graphite is mined in the Ukraine; abroad it is mined in Czechoslovakia, Austria, West Germany, Finland, the Malagasy Republic, and Ceylon. Cryptocrystalline graphite forms upon a change in the coal seams under the effect of magmatic rock. In the deposits of this type, the carbon content is 60–85 percent; the ores are used without dressing. Major deposits of such graphite are known in the USSR in the Urals and Krasnoiarsk Krai and abroad in Mexico and South Korea. In addition to the natural graphites, artificial types (blastfurnace and carbide graphites) also belong to the crystalline variety. Blast-furnace graphite is produced by slow cooling of large masses of iron, and carbide graphite is produced by the thermal decomposition of carbides. The graphite produced in electric furnaces by heating coals to a temperature of more than 2200° C belongs to the cryptocrystalline variety. Because of a number of valuable physicochemical properties, graphites are used in many areas of modern industry. Graphite’s high heat resistance has brought about its use in producing refractory materials and articles such as casting molds, crucibles, ceramics, and antipickup paints (in foundry work). Artificial clump graphite is used as an erosion-resistant coating for rocket engine nozzles, combustion chambers, and nose cones and for making certain rocket parts. As a consequence of its high electrical conductivity, graphite is widely used for manufacturing electrical-engineering articles and materials such as primary cells, alkaline storage batteries, electrodes, sliding contacts, heaters, and conducting coverings. The chemical resistance of graphite leads to its use in chemical machine building as a structural material (the production of lining tile, pipes, and heat exchangers). Its low coefficient of friction makes possible its use for manufacturing lubricants and antifriction articles. Blocks of very pure artificial graphite are used in nuclear engineering as reactor moderators. Finely ground cryptocrystalline graphite in the form of a suspension is used for preventing the formation of scale on the walls of steam boilers. Graphite is also used for producing pencils and paints. All the areas of use mentioned make very diverse demands on the quality of the graphite (in terms of purity, crystal size, and particle shape); therefore, the various types of graphite are not always interchangeable. Among the socialist countries, the USSR and Czechoslovakia lead in terms of the amount of graphite production. In the capitalist world, the largest amounts of graphite are produced by South Korea, Mexico. Austria, and West Germany. The best grades of large-crystal graphite are mined in small quantities in Ceylon and the Malagasy Republic. Veselovskii, V. S. Grafit, 2nd ed. Moscow, 1960. A mineral consisting of a low-pressure allotropic form of carbon; it is soft, black, and lustrous and has a greasy feeling; it occurs naturally in hexagonal crystals or massive or can be synthesized from petroleum coke; hardness is 1-2 on Mohs scale, and specific gravity is 2.09-2.23; used in pencils, crucibles, lubricants, paints, and polishes. Also known as black lead; plumbago. One of the forms under which carbon occurs in nature; electrically conductive; in powdered form, used as a lubricant. While, Hypermer LP1 is more likely to adsorb on graphitic carbon black in loops and trains. This indicated that these FeNPs might be encapsulated in an amorphous carbon matrix or disordered graphitic layers that were not observed through HRTEM, which protected Fe from being removed by acid washing. The ratio of integrated intensities (areas) of the D and G bands and the magnitude of the graphitic structure parameter [L.
Ion-pair chromatography on a porous graphitic carbon stationary phase for the analysis of twenty underivatized protein amino acids. They are getting gem-grade almandine crystals from the graphitic schist. Nanohorns have the same graphitic carbon atom structure as normal carbon nanotubes. Maximum operating pressure is 3000 psi, with surge capability as high as 3500 psi, and the units also have heavy-duty graphitic friction material that provides a high coefficient of friction and smooth engagement, the company said. Graphitic HAC contains less hydrogen and absorbs visible light. The study is expected to improve the ability to better identify pockets of graphitic ore. The oversized graphitic lump material and graphite fines will be tested for purity and deleterious elements, sorted and then retained on site in a stockpile for future processing. The topics include the integration of secondary states in the World System of the Eastern Mediterranean and Near East in the Late Bronze Age 6000-1200 BC, evidence from the "Serraglio" on Kos for Minoans in the southeastern Aegean, a comparative perspective on indigenous political dynamics and identity in Etruria and Latium vetus, long and close distance trade and exchange beyond the Baltic Coast during the Early Iron Age, and ceramic technology and the materiality of Celtic graphitic pottery.